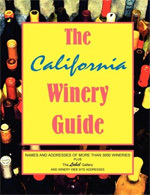 This wine book is a collection of all the wineries in California along with their addresses, internet sites, and phone numbers when available. For some wineries basic information that can be found on the wineries home page is also included; though none of it is useful. The book also has several pages of wine labels which have been poorly laid out and seemingly scanned with old equipment; all the pictures are blurry and small. This wine book should rather be called the California Winery Phone Book as it offers no additional information from which to make it useful. It neither offers the reader a critique of the winery nor does it add any useful information such as what types of wine are produced. The reader could as easily use the internet to find addresses and phone numbers and thus too would find more information on each winery. Overall this wine book is not recommended at all.